I can't remember the last time there was this much hype over a palette. It seems like everyone in the universe either wants it or has it. And I wasn't even going to get it originally because it's all brown, but I just can't seem to resist huge palettes like this. Lots of colors all in one place, I can see why so many people like this. The box it comes in is surprisingly nice for something that gets thrown away. Inside of a clear plastic sleeve, the palette and a mini Urban Decay Primer Potion tube are nestled inside a beautiful purple velvet tray. I don't even know what I'd use this tray for, but it seems too pretty to just chuck it. The palette itself is covered in a soft brown velvet material with gold foil lettering. The palette contains a mirror and a brush so it's well suited for travel. Left to right: Virgin, Sin, Naked, Sidecar, Buck, Half Baked, Smog, Darkhorse, Toasted, Hustle, Creep, Gunmetal. Swatched over Urban Decay Primer Potion, left to right: Virgin, Sin, Naked, Sidecar, Buck, Half Baked, Smog, Darkhorse, Toasted, Hustle, Creep, Gunmetal. I used: Virgin, Sin, Hustle Creep and Urban Decay 24/7 in Bourbon. See the tiny sparkles in the liner? I'm surprised they showed up in the pictures but I'm glad they did. There's already about a gazillion reviews of this palette, so I'll make mine short and sweet. It's a good value because you get 12 full size (0.05oz) shadows, a small primer and a brush for $48. Some of the shades are exclusive to the palette. Good range of browns and earthy shades all in one palette. Good size, doesn't take up much space, has a magnetic closure. The brush it comes with is very nice. Pigmentation on the shades was varied; some were excellent and some were hard, uneven and not as pigmented. Mainly the mattes, but Hustle and Creep gave me a little trouble as well. After the out of stock eyeliner situation which resulted in the palette coming with a brush instead, they replaced the back label with a sticker. The sticker peels up immediately because it's on top of velvet and it looks really ugly. The shades are all so warm, there isn't a good balance between warm, neutral and cool shades in the palette. Overall, it's a really good deal because it would be over $230 if one were to buy all the shadows and the brush separately. I personally find the shades too warm for my skin tone and I'm just not that much of a brown shadow wearer so I could have passed on this, but I just couldn't resist the siren song of an Urban Decay palette. Also, I really wish they didn't put that horrible sticker on the back! I understand why they did it, and they'll probably make a new batch without the stucker, but UGH! So ugly! This is NOT a limited edition item and it seems like everyone has now restocked so it should be easy to find now. I got mine from Sephora, but Ulta has it too. I wanted this, like the rest of the world, when it first dropped, but didn't get it only because it has bismuth oxychloride, and my poor eyelids are allergic to that ingredient. I was lucky and got this over a year ago when it first came out. It is my go to palette everyday of the week. I just love it! I'm glad it is finally back for others to get! Seriously, I think everyone and their mom really do have this palette. I was talking to my mom on the phone the other day, who has never worn eyeshadow in her life, and she told me that she went to Sephora and bought something called "naked eyeshadow". I was like, "What the hell? Seriously?!" EVERYONE has it, haha. Well, I don't have it and I'm still not sure if I'm going to get it or not. I know it's such a hype around it, and it seems like a good base palette but... that's all.. or..? The palette is beautiful (makeup is always beautiful! ), but the colors don't really come and get me... 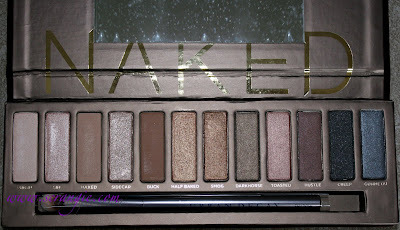 I don't think I would buy this palette, I already have too much eyeshadow that are the similar colors. Girl. Honestly, you are just too beautiful. Although it's the kinda thing I would wear, I actually passed on this one. Is it odd that I'm put off, rather than excited by the hype? I call Naked "Rachael Ray in a box". Because I have this palette I passed on getting the anniversary one because I have enough neutral shades and I just bought some brights from Sugarpill and Wet n Wild. It's great for work colors. I'd be interested to hear/read your thoughts on naked vs Stila's natural eyes palette! I got it a while ago and I really like it. It's surprisingly versatile and only one of the shades is glittery. I love that it is so thin. Sometimes I'll bring it traveling and bring one of the mac 6 shade holiday packs with brighter shades to create brighter looks (along with the naked palette). The matte colors are pretty gorgeous. None of the shades show up chalky or icky on my skin. I love that you can do neutral matte looks, golden shimmery looks, smokey brown and smokey grey/black looks. I bought this one also. I just couldn't resist it. I also just bought the Urban Decay Anniversary palette. Can't resist these palettes. 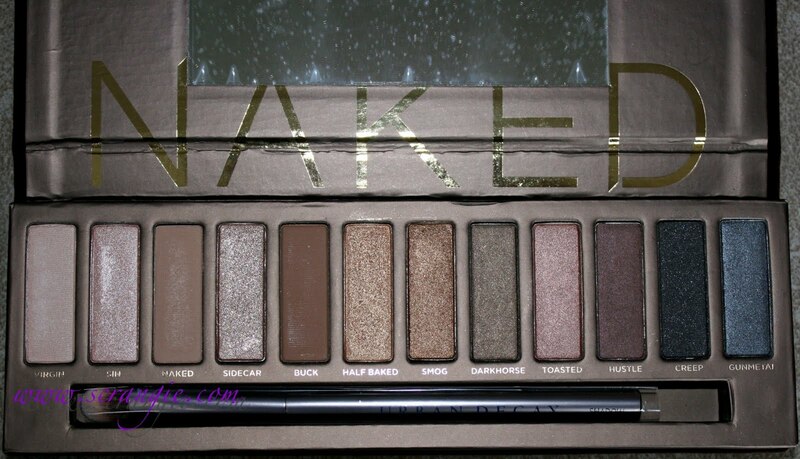 This is my all time fav pallet ever. I have the origional one with the eyeliner pencil in it vs. the brush - I would rather have the brush in it...I am thinking of getting a 2nd one so I never run out as there are some shades in here that are no more now they axed their matte collection and then some that were unique just to this collection. I am not as big of fan of the 15th Anniv. Palette as I am this one. I felt the same way you did, too many browns! I do understand the need for neutrals but I did not understand the hype surrounding this palette. I ended up receiving it as a gift but returned it and put the credit toward buying the 15th Anniversary Eyeshadow Set instead. So glad I did! Plenty of neutrals that are not boring as well as some really beautiful colors. I'm guessing you'll be reviewing that as well, can't wait! I'm still on the fence about this one, Scrange. Your honest reviews are so appreciated. They always either push me over to make a purchase or make me go "Meh....never mind." You rock! Still really want to try this one out just not entirely won over just yet, thanks for being so honest! Jessi M, my mom was the same way! The other day she says to me, "I want to get those naked eyeshadows from Ulta" and I was like... since when do you care about Urban Decay?! It's a phenomenon! My Nail Polish Online, that's pretty much it! Not very exciting but a really good deal, especially if you don't have many browns. Kaz, I feel put off by some of the overhyped stuff too, so it's not just you... But I can't seem to resist palettes. I have the sickness. Thank you, everyone! Looks like we are pretty evenly divided on awesome versus boring!